We have 17 registered suppliers in this Province ..! The Province of Chimborazo is one of the 20 provinces that make up the Republic of Ecuador, located in the southern center of the country, in the geographical area known as the interandean region or sierra, mainly on the Chambo basin in the northeast and the Chimbo basins and Chanchán in the southwest. Its administrative capital is the city of Riobamba, which is also its largest and most populated city. It occupies a territory of about 5,287 km², being the seventeenth province of the country by extension. It limits to the north with Tungurahua, to the south with Cañar, by the west with Bolívar, to the southeast with Guayas and to the east with Morona Santiago. In the Chimboracense territory there are 458,581 people, according to the last national census (2010), being the ninth most populated province of the country. The Province of Chimborazo is made up of 10 cantons, from which their respective urban and rural parishes are derived. According to the latest territorial order, the province of Chimborazo will belong to a region also comprised by the provinces of Cotopaxi, Tungurahua and Pastaza, although it is not officially formed, known as the Central Region. It is one of the most important administrative, economic, financial and commercial centers of Ecuador. The development of the industry in the province, in general, was based on the manual skills of its inhabitants. It has a very unique importance for the history of the center of Ecuador, for being a midpoint between the coast and the Amazon, since ancient times it was established as a meeting place between cultures, merchants and events of religious connotation. The first recorded settlements date back to 5 thousand years old near the Punín sector. He had different migratory periods from the mountains such as the puruhás and cañaris. Later on it was conquered by the Incas under the command of Huayna Cápac. The Spanish colonization occurred on August 15, 1534 with the foundation of Santiago de Quito; during that period the maximum entity and precursor of the province would be the Corregimiento of Riobamba. 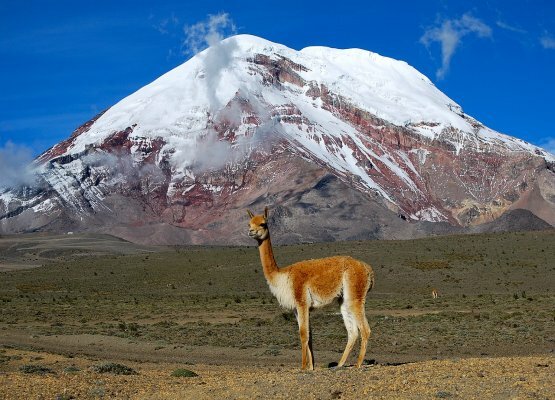 After the independence war and the annexation of Ecuador to the Gran Colombia, the Province of Chimborazo was created on June 25, 1824, which makes it one of the first 7 provinces of Ecuador.